It looks like Bud Light wants to make a personal connection with its consumers, and what better way to do that than with individualized packaging? The beer giant is at it again, partnering with 28 of the 32 NFL teams on team-specific can designs for the 2015-2016 season. Bud Light already introduced 200,000 different cans for this summer's Mad Decent Block Party music festival. While those designs are only available to festivalgoers, the new NFL cans are available nationwide and are on shelves now. 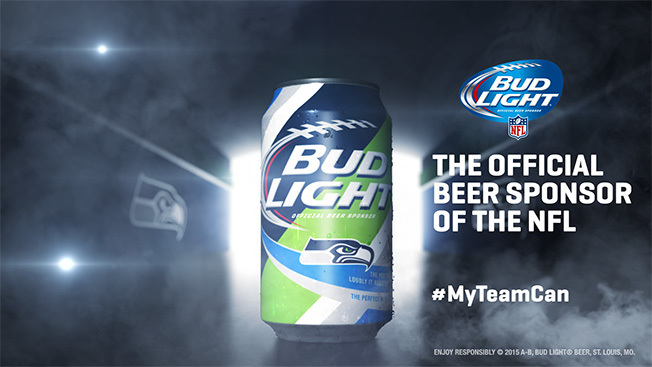 According to a spokeswoman, Bud Light sponsors the 28 teams that now have team-specific cans. The Chicago Bears, Green Bay Packers, Dallas Cowboys and Minnesota Vikings were omitted because they are sponsored by MillerCoors. "Ultimately, fans love football and the NFL, but what they really invest in emotionally each week is their individual team," said Alex Lambrecht, vp of Bud Light. "Throughout the 2015-16 season, Bud Light and its team partners will be unrelenting in delivering incredible, one-of-a-kind experiences to fans in their local team stadiums and markets." Each design also features a custom message printed on the can—a tagline unique to each team—like the ones used during the brand's "Up for Whatever" campaign. With the campaign, Bud Light continues to try to make a personal connection with consumers, and it doesn't hurt that it's the official beer sponsor of the NFL. The brand did not use vertical-printing technology from HP—as it did for the Mad Decent Block Party cans—for the NFL cans.